BeauSoleil returned to the University of Louisiana at Lafayette campus following Solar Decathlon 2009. Public tours: The house is open Tuesdays and Thursdays from 1 p.m. to 3 p.m.
After the U.S. Department of Energy Solar Decathlon 2009, the University of Louisiana at Lafayette's BeauSoleil returned to campus, where it will remain. "We put it here on campus so that students can experience it over the next several years and learn from it," says Dr. Geoff Gjertson, the 2009 team's faculty leader. On March 25, 2010, a dedication ceremony officially marked BeauSoleil's permanent location next to Fletcher Hall, where the art and architecture program is based. At Solar Decathlon 2009, BeauSoleil won the People's Choice Award. 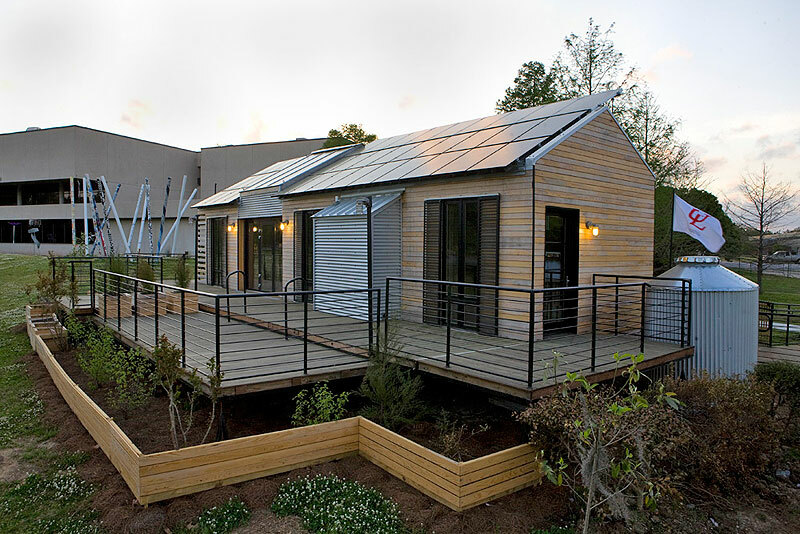 This accolade proved that the University of Louisiana at Lafayette succeeded in creating a solar-powered house that people wanted to call home. Much of BeauSoleil's appeal stemmed from its local flavor. The students made sure to incorporate space for Acadian cultural traditions such as cooking, entertaining, and socializing into their design. The result was a maison (house) with universal appeal. The house is open for public tours on Tuesdays and Thursdays from 1 p.m. to 3 p.m. Faculty members and students have been recording livability in a log while they enjoy weekend stays in BeauSoleil. The house has been the subject of multiple student thesis reviews and seminars. For example, new engineering students are learning about the solar panels and new architecture students are making modifications and additions to the design. Find more information about the team's vision on the BeauSoleil website.